Could new product releases from big-brand confectioners boost the chocolate category for c-stores? Easter, Halloween and Valentine’s Day make up the trifecta for chocolate sales. Not only do these holidays traditionally highlight the sweet treat as a special indulgence, but they’ve become a prime marketing opportunity for confectioners to test out new flavor profiles, shapes and sizes. Marcia Mogelonsky, director of Insight for Mintel Food and Drink explained recently that data from the research firm indicates seasonal chocolate offerings are tops among new chocolate products—a testament to the popularity of seasonal treats among consumers. In fact, Mintel reports seasonal items represented one-fourth of worldwide chocolate product introductions in 2016. Now that Easter’s come and gone, and it’s several months until Halloween, c-store sales of chocolate candy likely will settle back into everyday levels. However, those levels haven’t budged much over the past few years. According to Euromonitor International, volume sales of chocolate confections grew by 1% in 2016. The numbers don’t improve much when examined on the smaller scale of the convenience store channel, which accounts for 25% of the market according to the National Confectioners Association (NCA). In its state-of-the-industry assessment, the National Association of Convenience Stores (NACS) revealed both candy and sweet snacks showed restrained growth. Specifically, candy was identified as the sixth strongest category performer in c-stores, but experienced slightly more than a 3% increase in sales per store per month between 2015 and 2016. Although sweet snacks remained among the top 10 category performers, the category generated a 1.3% per store per month increase over the same period. When comparing year-to-year gross margins, candy rang up an increase of 0.59%, while sweet snacks fared better with 1.27%. “Overall, I would describe chocolate sales as surprisingly stable with slight dollar increase over last year,” said Jody Sandberg, manager for field merchandising for United Refining Co. (URC). In addition to its petroleum refining operations, the Warren, Pa.-based company owns approximately 300 Kwik Fill/Red Apple Food Marts retail locations in three states and 70 Country Fair convenience stores. It also services more than 30 independently-owned Keystone fuel retailers. “We should see an increase with the addition of counter shipper units going into all stores not presently involved in the larger shipper program and by decreasing the mint/gum by one shelf and making more chocolate offerings,” Sandberg added. Other than seasonal promotions, most new additions to the chocolate confections category have come from artisan and premium brands, which NCA defines as chocolate upwards of $11 per pound. “Premium continues to lead all growth, clocking in at +10% in 2016. Because premium is often sold in smaller quantities, we’re also seeing robust growth in the box, bag, and bar smaller than 3.5 ounces segment; that grew 3.2% over the 52 weeks ending March 19, 2017,” said Jenn Ellek, NCA’s senior director for trade marketing and communications. Many of the smaller brands have been trying to capitalize on the better-for-you trend. To entice people to give into their cravings for a chocolate treat, this group of confectioners often feature dark chocolate instead of the more sugary milk chocolate, and stir in fruit and other ingredients consumers typically regard as healthier. That trend, however, is being challenged this year by Hershey, Mars Inc. and Mondelez International. The big three chocolate producers all have announced or released new product formulations under their most recognizable brands, hoping to boost market share and recapture customers’ loyalty. “We all go through that healthier stage in our lives, but I truly feel the majority will always come back to their childhood favorite and totally forget the ingredients on the package, and just enjoy what really brings them comfort and immediate satisfaction,” said Dennis Peters, URC merchandise manager. Mars has announced an ambitious new product campaign, starting last December when it rolled out a variety of Dove options, including Dove Fruit Mixed Berries Dipped in Dove Dark Chocolate and Dove Fruit Dark Chocolate Cherry & Sea Salt Almond. In April, it launched Dove Peanut Butter & Dark Chocolate Promises, with a price point of $4.09 to $4.79 for a 7.94-ounce laydown bag. While the Dove product line has welcomed new flavor combinations from time to time, Mars has been reticent to alter people’s expectations with its leading brands of Snickers, Twix and M&M’s, until now that is. Already on store shelves is the Snickers & Hazelnut Bar, offering fans a nutty twist on the original recipe. The company hopes consumers will embrace adding caramel to M&M’s Chocolate Candies, even though this brand already enjoys one of the highest household penetrations of any chocolate product, per Nielsen as reported by Food Business News. Company executives want to take advantage of the current caramel favoritism. According to Nielsen findings, caramel has been one of the fast-growing flavors over the past 18 months. M&M’s Caramel Chocolate Candies is expected to hit the retail space this spring. Introduced last fall, Hershey’s Cookie Layer Crunch exemplifies the “snackfection” concept of pairing chocolate with ingredients such as fruits, nuts, seeds and pretzels. The candy bar features layers of cookie pieces and fillings coated by chocolate. It’s available in three flavors: Caramel with shortbread cookie; vanilla crème with chocolate cookie; and mint with chocolate cookie. Another snackfection offering is Hershey’s Cookies ‘n’ Crème Crunchers or Reese’s Crunchers. These combos provide a multi-textural sensation and come in single-serving bags. Not to be outpaced, Mondelez partnered its two biggest brands with the Milka Oreo Chocolate Candy Bar, available in three sizes: 0.44 ounce, 98 cents suggested retail; 2.88 ounces, $1.69 suggested retail; and king size 3.52 ounces with $1.70 suggested retail. There’s also the Milka Oreo Big Crunch Chocolate Candy Bar, 10.5 ounces for a suggested retail price $4.99, which had a limited rollout last fall before going nationwide earlier this year. Havely also added these options to each of the company’s 64 stores. The same expectation goes for United Refining. “We have incorporated many of them into our (planograms) sets for the 2017 calendar year. If not in our sets, they will be in shipper form at a later time,” said Sandberg. In terms of new chocolate offerings, the convenience channel has proven to be a strong market. 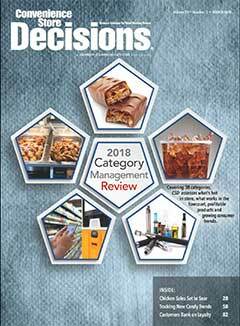 “C-stores have been extremely successful in leading new item introductions and cross-merchandising chocolate as a little treat when in the store to buy gasoline or other items,” Ellek added. Ellek also anticipates the “new” theme to continue to grab the spotlight at this year’s NCA Sweets & Snacks Expo in Chicago later this month, where more than 760 confectionary and snack manufacturers are slated to exhibit.